This 2019 Toyota Tacoma 2WD SR is offered to you for sale by Kendall Toyota Oregon. This Toyota includes: 50 STATE EMISSIONS *Note - For third party subscriptions or services, please contact the dealer for more information. * Just what you've been looking for. With quality in mind, this vehicle is the perfect addition to take home. The look is unmistakably Toyota, the smooth contours and cutting-edge technology of this Toyota Tacoma 2WD SR will definitely turn heads. The Toyota Tacoma 2WD SR will provide you with everything you have always wanted in a car -- Quality, Reliability, and Character. This outstanding example of a 2019 Toyota Tacoma 2WD SR is offered by Kendall Toyota Oregon. This Toyota includes: 50 STATE EMISSIONS *Note - For third party subscriptions or services, please contact the dealer for more information. * You've found the one you've been looking for. Your dream car. This is about the time when you're saying it is too good to be true, and let us be the one's to tell you, it is absolutely true. The Toyota Tacoma 2WD SR will provide you with everything you have always wanted in a car -- Quality, Reliability, and Character. This 2019 Toyota Tacoma 2WD SR is proudly offered by Kendall Toyota Oregon This Toyota includes: 50 STATE EMISSIONS *Note - For third party subscriptions or services, please contact the dealer for more information. * You can finally stop searching... You've found the one you've been looking for. This is the one. Just what you've been looking for. The look is unmistakably Toyota, the smooth contours and cutting-edge technology of this Toyota Tacoma 2WD SR will definitely turn heads. Contact Kendall Toyota Oregon today for information on dozens of vehicles like this 2019 Toyota Tacoma 2WD SR5. You've found the one you've been looking for. Your dream car. Based on the superb condition of this vehicle, along with the options and color, this Toyota Tacoma 2WD SR5 is sure to sell fast. The look is unmistakably Toyota, the smooth contours and cutting-edge technology of this Toyota Tacoma 2WD SR5 will definitely turn heads. You could keep looking, but why? You've found the perfect vehicle right here. Contact Kendall Toyota Oregon today for information on dozens of vehicles like this 2019 Toyota Tacoma 2WD SR. This Toyota includes: 50 STATE EMISSIONS MUDGUARDS ARRAY(0x17a78c80) Floor Mats ARRAY(0x169e66c8) Daytime Running Lights *Note - For third party subscriptions or services, please contact the dealer for more information. * Whether for work or play, this Toyota Tacoma 2WD is built to handle the job. This is the one. Just what you've been looking for. This is about the time when you're saying it is too good to be true, and let us be the one's to tell you, it is absolutely true. You can find this 2019 Toyota Tacoma 4WD SR and many others like it at Kendall Toyota Oregon. This Toyota includes: 50 STATE EMISSIONS *Note - For third party subscriptions or services, please contact the dealer for more information. * No matter the terrain or weather, you'll drive at ease in this 4WD-equipped vehicle. With exceptional safety features and superb handling, this 4WD was engineered with excellence in mind. The Toyota Tacoma 4WD SR will provide you with everything you have always wanted in a car -- Quality, Reliability, and Character. You can finally stop searching... You've found the one you've been looking for. You can find this 2019 Toyota Tacoma 4WD SR and many others like it at Kendall Toyota of Bend. This Toyota includes: 50 STATE EMISSIONS *Note - For third party subscriptions or services, please contact the dealer for more information. * This vehicle comes with 4WD for better traction on unstable surfaces, like snow and dirt to give you the edge over anything you might encounter on the road. You can finally stop searching... You've found the one you've been looking for. There is no reason why you shouldn't buy this Toyota Tacoma 4WD SR. It is incomparable for the price and quality. This outstanding example of a 2019 Toyota Tacoma 4WD SR is offered by Kendall Toyota Oregon. This Toyota includes: 50 STATE EMISSIONS Running Boards/Side Steps COLOR KEYED REAR BUMPER *PRICE TO FOLLOW* *Note - For third party subscriptions or services, please contact the dealer for more information. * No matter the terrain or weather, you'll drive at ease in this 4WD-equipped vehicle. With exceptional safety features and superb handling, this 4WD was engineered with excellence in mind. Beautiful color combination with Quicksand exterior over Cement Gray interior making this the one to own! The Toyota Tacoma 4WD SR will provide you with everything you have always wanted in a car -- Quality, Reliability, and Character. This outstanding example of a 2019 Toyota Tacoma 2WD SR5 is offered by Kendall Toyota Oregon. This Toyota includes: HARD TRI-FOLD TONNEAU COVER Pickup Bed Tonneau Cover 50 STATE EMISSIONS *Note - For third party subscriptions or services, please contact the dealer for more information. * Just what you've been looking for. With quality in mind, this vehicle is the perfect addition to take home. You've found the one you've been looking for. Your dream car. You can finally stop searching... You've found the one you've been looking for. Contact Kendall Toyota Oregon today for information on dozens of vehicles like this 2019 Toyota Tacoma 2WD SR5. This Toyota includes: HARD TRI-FOLD TONNEAU COVER Pickup Bed Tonneau Cover 50 STATE EMISSIONS *Note - For third party subscriptions or services, please contact the dealer for more information. * Based on the superb condition of this vehicle, along with the options and color, this Toyota Tacoma 2WD SR5 is sure to sell fast. You've found the one you've been looking for. Your dream car. The look is unmistakably Toyota, the smooth contours and cutting-edge technology of this Toyota Tacoma 2WD SR5 will definitely turn heads. You can find this 2019 Toyota Tacoma 2WD SR5 and many others like it at Kendall Toyota Oregon. This Toyota includes: HARD TRI-FOLD TONNEAU COVER Pickup Bed Tonneau Cover 50 STATE EMISSIONS *Note - For third party subscriptions or services, please contact the dealer for more information. * The Toyota Tacoma 2WD SR5 will provide you with everything you have always wanted in a car -- Quality, Reliability, and Character. This is the one. Just what you've been looking for. Just what you've been looking for. With quality in mind, this vehicle is the perfect addition to take home. This outstanding example of a 2019 Toyota Tacoma 4WD SR5 is offered by Kendall Toyota Oregon. This Toyota includes: 50 STATE EMISSIONS SR5 APPEARANCE PACKAGE (SM) Chrome Wheels Aluminum Wheels Steel Wheels SR5 PACKAGE *Note - For third party subscriptions or services, please contact the dealer for more information. * This 4WD-equipped vehicle will handle beautifully on any terrain and in any weather condition your may find yourself in. The benefits of driving a 4 wheel drive vehicle, such as this Toyota Tacoma 4WD SR5, include superior acceleration, improved steering, and increased traction and stability. The look is unmistakably Toyota, the smooth contours and cutting-edge technology of this Toyota Tacoma 4WD SR5 will definitely turn heads. You've found the one you've been looking for. Your dream car. Kendall Toyota Oregon is excited to offer this 2019 Toyota Tundra 4WD. This Toyota includes: SPRAY-ON BEDLINER (PPO) Bed Liner ALL WEATHER FLOOR LINER Floor Mats 50 STATE EMISSIONS Bed Liner Running Boards/Side Steps *Note - For third party subscriptions or services, please contact the dealer for more information. * When Toyota created this vehicle with 4 wheel drive, they immediately enhanced the performance ability. Easily switch between two and four wheel drive to take advantage of the improved steering and superior acceleration. Beautiful color combination with Super White exterior over Graphite interior making this the one to own! There is no reason why you shouldn't buy this Toyota Tundra 4WD SR. It is incomparable for the price and quality. Contact Kendall Toyota Oregon today for information on dozens of vehicles like this 2019 Toyota Tacoma 4WD SR5. This Toyota includes: WHEELS: 16 SILVER ALLOY (STD) Aluminum Wheels MUDGUARDS (PPO) SR5 PACKAGE 50 STATE EMISSIONS Running Boards/Side Steps *Note - For third party subscriptions or services, please contact the dealer for more information. * Want to brave the road less traveled? You'll have the 4WD capabilities to do it with this vehicle. The Toyota Tacoma 4WD SR5 will provide you with everything you have always wanted in a car -- Quality, Reliability, and Character. You can finally stop searching... You've found the one you've been looking for. This outstanding example of a 2019 Toyota Tacoma 4WD SR is offered by Kendall Toyota Oregon. This Toyota includes: 50 STATE EMISSIONS Running Boards/Side Steps COLOR KEYED REAR BUMPER *PRICE TO FOLLOW* *Note - For third party subscriptions or services, please contact the dealer for more information. * Simply put, this Four Wheel Drive is engineered with higher standards. Enjoy improved steering, superior acceleration, and increased stability and safety while driving this 4WD Toyota Tacoma 4WD SR. This vehicle won't last long, take it home today. You can finally stop searching... You've found the one you've been looking for. This 2019 Toyota Tacoma 4WD SR is offered to you for sale by Kendall Toyota Oregon. This Toyota includes: MUDGUARDS (PPO) 50 STATE EMISSIONS Running Boards/Side Steps COLOR KEYED REAR BUMPER *PRICE TO FOLLOW* *Note - For third party subscriptions or services, please contact the dealer for more information. * When Toyota created this vehicle with 4 wheel drive, they immediately enhanced the performance ability. Easily switch between two and four wheel drive to take advantage of the improved steering and superior acceleration. The look is unmistakably Toyota, the smooth contours and cutting-edge technology of this Toyota Tacoma 4WD SR will definitely turn heads. Just what you've been looking for. With quality in mind, this vehicle is the perfect addition to take home. Contact Kendall Toyota Oregon today for information on dozens of vehicles like this 2019 Toyota Tacoma 4WD SR. This Toyota includes: ALL WEATHER FLOOR LINER Floor Mats SR CONVENIENCE PACKAGE Power Door Locks Keyless Entry 50 STATE EMISSIONS *Note - For third party subscriptions or services, please contact the dealer for more information. * Take home this Toyota Tacoma 4WD SR, and you will have the power of 4WD. It's a great feature when you need to drive over tricky terrain or through inclement weather. You can finally stop searching... You've found the one you've been looking for. There is no reason why you shouldn't buy this Toyota Tacoma 4WD SR. It is incomparable for the price and quality. This 2019 Toyota Tacoma 4WD SR5 is proudly offered by Kendall Toyota Oregon This Toyota includes: ALL WEATHER FLOOR LINER Floor Mats 50 STATE EMISSIONS HARD TRI-FOLD TONNEAU COVER Pickup Bed Tonneau Cover *Note - For third party subscriptions or services, please contact the dealer for more information. * This vehicle comes with 4WD for better traction on unstable surfaces, like snow and dirt to give you the edge over anything you might encounter on the road. You've found the one you've been looking for. Your dream car. Based on the superb condition of this vehicle, along with the options and color, this Toyota Tacoma 4WD SR5 is sure to sell fast. Contact Kendall Toyota Oregon today for information on dozens of vehicles like this 2019 Toyota Tacoma 4WD SR5. This Toyota includes: 50 STATE EMISSIONS SR5 PARKING SONAR Smart Device Integration HD Radio Navigation System CD Player Auto-Dimming Rearview Mirror Rear Parking Aid Back-Up Camera AM/FM Stereo Satellite Radio Bluetooth Connection Auxiliary Audio Input MP3 Player *Note - For third party subscriptions or services, please contact the dealer for more information. * With 4WD, you can take this 2019 Toyota Tacoma 4WD to places roads don't go. It's all about the adventure and getting the most enjoyment out of your new ride. You can finally stop searching... You've found the one you've been looking for. The look is unmistakably Toyota, the smooth contours and cutting-edge technology of this Toyota Tacoma 4WD SR5 will definitely turn heads. This 2019 Toyota Tundra 4WD SR5 is proudly offered by Kendall Toyota Oregon This Toyota includes: SPRAY-ON BEDLINER (PPO) Bed Liner ALL WEATHER FLOOR LINER Floor Mats 50 STATE EMISSIONS Bed Liner Running Boards/Side Steps *Note - For third party subscriptions or services, please contact the dealer for more information. * This Toyota Tundra 4WD SR5 comes equipped with 4 wheel drive, which means no limitations as to how or where you can drive. Different terrains and varying weather conditions will have no effect as to how this vehicle performs. Just what you've been looking for. With quality in mind, this vehicle is the perfect addition to take home. This is about the time when you're saying it is too good to be true, and let us be the one's to tell you, it is absolutely true. Are you shopping for a new truck in Oregon? With the help of the staff at your nearby Kendall Auto Oregon dealership, you can find the new truck you’re searching for. Shop our popular selection of trucks that includes the new Ford F-150, Chevrolet Silverado 1500, Toyota Tacoma, and much, much more. Learn more about our available new trucks by getting in touch with your nearby Kendall sales team! Contact us at your nearest Kendall dealership to see how we can help get you behind the wheel of your next pickup truck in Eugene or Bend. We look forward to hearing from you and helping you during your visit to your nearby Kendall Auto Oregon truck dealership. Find the new truck you’ve always wanted when you shop our huge inventory of new trucks in Eugene and Bend. With a variety of customization options available for your new truck, the staff at your nearby Kendall Auto Oregon location is sure that we can find the new pickup truck that suits you in the Bend and Eugene areas. While you’re here, you can also shop our like-new Certified Pre-Owned cars or inventory of used cars. With a number of options in our new truck catalog, we’re sure you’ll find a new pickup truck that catches your eye. Shop our large inventory of new trucks for sale in Eugene and Bend and our friendly sales team will help you find the truck that has the right features amenities for you. Browse our available brands of new trucks in Oregon that include Ford trucks, Chevrolet trucks, and many more. 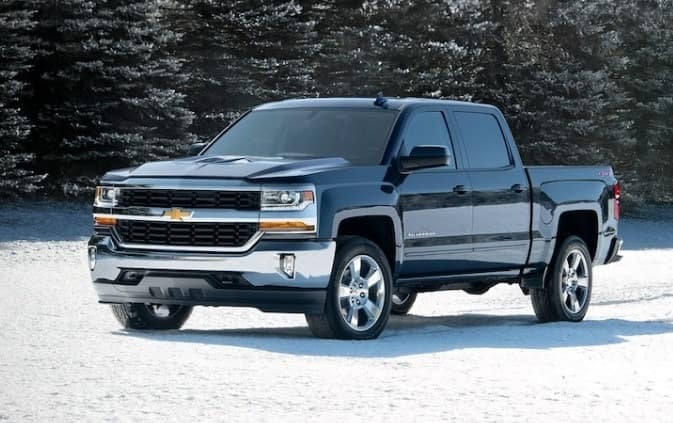 The Chevy Silverado 1500 is a versatile pickup truck with capable payload and towing capacity that is perfect for any job. Be sure to shop our available inventory of the Ford F-150, which is the top-selling pickup truck in America 41 years running. Come by your nearby Kendall truck dealership in Eugene or Bend and shop our selection of new trucks today. We’re sure you’ll love what you find.